We want to thank God for all the incredible blessings He has given us, mainly His Son, and you all. If you have received this today, know that we love you very much. It may be that there are some of you who might not know Jesus Christ as their personal Savior and Lord and we want to encourage you to consider what the Bible calls "of first importance". That is, "That Christ died for our sins,... that He was buried, that He was raised on the third day". He promises eternal life and forgiveness of sins to all those who repent of their sins and place their faith in Him. "For God so loved the world that He gave His only begotten Son so that whoever believes in Him should not perish but have eternal life"; "God...now commands all men everywhere to repent, because He has appointed a day in which He will judge the world in righteousness"; "God demonstrates His own love towards us in that while we were yet sinners, Christ died for us". Thank you again to all who gave to us and prayed for us through our recent trial. We love you! Merry Christmas! p.s. My favorite Christmas blog post is still Merry Christmas! (The gift of Christian Heritage,...the reason for the season) by my buddy Junior. Check it out. p.p.s. Kenya got to open one present on Christmas Eve and she picked the Kid Tough Digital Camera that Vanessa and I got her. 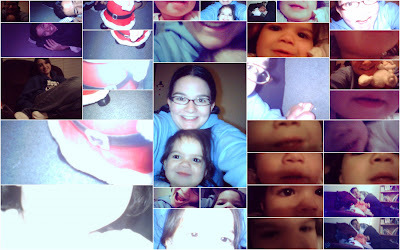 She is just like her Mom, in that she can take over 140 pictures in just hours! And she is like Destinee and all her girly teenage friends, in that most of the pictures are of herself! p.p.p.s. Kenya wants to tell you all Merry Christmas! jason d. and the rest of the familia! Every year everyone gets to pick one new ornament for the Christmas Tree. This was the first year Kenya was able to pick out her own ornament. It was so much fun watching her look at all the different ornaments until she finally picked the one she wanted. When Jason was walking around with Kenya at the store and I was looking for an ornament, I heard Kenya say, "Look! It's Melody and Madison!" I turned around quickly to find Kenya and Jason looking at the ornament bellow. I couldn't believe it Kenya found it all by herself. I was thinking before we left the house that I really wanted to find an ornament for Melody and Madison and I just knew that it wasn't going to happen. I knew that nothing would be good enough, there was no way I was going to find an ornament with conjoined twins. Well, I didn't,...but Kenya did! I love this ornament because it has two baby angels joined together holding one heart. How sweet is that! Don't mis-read me here, I know that our babies are in Heaven and are humans, not angels in Heaven. The Bible makes a clear distention between angels and humans. It was just really sweet and reminded me of our girls! I loved that the babies have their arms around each other. I know this may not mean a lot to many people but it just blessed me that we were able to find such a perfect ornament for our girls. This picture was taken about six months ago. I thought it was too cute not to share! I started doing a little preschool with Kenya and she loves it! "Thank you my God, thank you for my food, AMEN!" It is so cute! She is learning to pray about other thing but it's a start. Then when we are done she folds up her blanket and puts it back where it goes. This week in circle time we are reading about the birth of Jesus from Luke 2.
for Melody Joy and Madison Hope to be born. Dr. Tabor you did a great job and I thank the Lord for you. Melody Joy and Madison Hope Born on November 11, 2008. It was indeed A Beautifully Wonderful Perfect Day. Here we are watching our babies BREATH! One month ago today we got to welcome our beautiful baby girls into the world and on that same day they were welcomed into Heaven. One month ago today was one of the hardest and most amazing days of my life. I DREAD this question! I never know how to answer it. Jason and I were in the mall and one of the sales people and I were talking. She was shocked that I was married, she thought I was 16 (which most people do when they first meet me). Then I told her you should see the looks that I get when I'm pregnant. She looked down at my belly and I quickly said, "Oh, I'm not pregnant." She asked, "Do you have any kids?" I answered, "We have a two year old daughter and we have custody of my sister who is 15." She was just shocked. Anyway the whole time I was telling her this I wanted to scream, "...and, we also have twin girls, yes conjoined twin baby girls that were alive for 32 weeks inside of my womb, twin girls that lived for less than an hour outside my womb, twin baby girls that I felt move inside of me for 17 weeks, twin girls that amazed me when they both came out breathing, conjoined twin girls and I'm so proud to be their Mom, twin baby girls that I would love to get to go back to that day and hold them just a little bit longer, twin baby girls that are now safe in the arms of God!" You see we don't have two kids we have four,... so why is it so hard for me to tell people that when they ask? Destinee age 15 - We love you Dessy Poo! Kenya 25 months old - Kenya boo's we love you! Melody Joy - look at those cute lips and that perfect nose. I love you my little M&M! Madison Hope - you looked just like you sister :) the same cute lips and perfect nose. Look at those adorable fingers so perfect and complete. I love you my sweet baby girl! So there you have it my name is Vanessa and I'm the proud Mom to four beautiful girls! I haven't talk about the teenager very much on the blog so here it goes. I just want you all to know that it has been such a joy having my sister Destinee live with us. It has been so neat to watch her grow up over the past few years. She is a joy to be around and lights up whatever room she is in. She is also a very thoughtful person, in fact she gave us her Christmas list tonight. She typed out a list that included the gift, where we could find it, and how much it cost. HAHAHAHA the thought of it all makes me laugh. Ok, I'm not totally being honest it was a project for school and it really does help. It's not easy knowing what to get a 15 year old. So thank you Destinee for making our life easier! Destinee we love you very much and are so glad that you are a part of our family! in Christ Jesus for you." But this has been a time of much thankfulness,..at many times overwhelming thankfulness at how God has provided for us, comforted us, refined us, encouraged us, humbled us, loved us, ect... especially in these hard times. I could leave this blog entry at that and just say, "THANK YOU!" to everyone, but I don't want to make it sound simply esoteric and mystical how God has provided all that He has provided for us (though it is no doubt supernatural). I don't want to confuse anyone by simply saying (as we have said much on this blog) that "God is sovereign" and think we expect things to just fall into our laps from God because He is all powerful and good. So let me start by saying God ordains the means as well as the end. What do I mean by this? One quick example is that God tells us in Matthew 6:25-34 to not be anxious for food, drink, or clothing, cause our Heavenly Father will provide those things to us. So God has ordained that He will provide food, drink, and clothing for us. He also ordains the means. But how does He do this specifically? I'll just use food for this example. In some rare special cases the means was supernatural, like when He just dropped food down with the morning dew for Israel when they were in the wilderness (Numbers 11:9), or when God sent ravens to feed Elijah (1 Kings 17:1-6), ect... But, for the majority of people this is not how God provides. that he may bring forth food from the earth"
He makes grass grow on the hills." And He is before all things, and in Him all things hold together.". So I hope that little example helps you see how God ordains the end as well as the means. There is much much more to be said about this (like God also provides the sun, water, ect... things needed for food) but I think that will suffice for my purpose. Thank you, thank you. I thank God for all of you. I thank God for pastors. Who, just by being faithful to preach the Bible, prepared us for the various kinds of trials that the Bible says we as believers are promised. I thank God that they are not afraid to preach the whole counsel of God, not holding anything back, even when it may not be the most pleasing to hear. Pastor Bill thank you for shepherding me for 5 years (right after I became a new convert). You taught me so much about the Scriptures, words just can't express how thankful I am to God for you. for building up the body of Christ,..."
We have been just blown away by every one's love and generosity toward us. I just wanted to list as many things as I can think of that the Lord used yall to bless and encourage us with. Thank you to the blogging world you have all been so encouraging and have even used your blogs as a way to ask for more people to pray for us. Thank you all for the comments you left on our blog I wish I had time to respond to them all but please know that we do read them and the Lord has used them to encourage us. Thank you all for spreading the word about Melody and Madison. I was reading back to our post after we found out that the girls were conjoined. I was reading our prayer request list and it was just so amazing how God answered our prayers. Lets reread them together. God was glorified and is still being glorified through Melody and Madison's lives! Their heart was strong enough to support them both during my pregnancy and even for an hour after they were born. This was one of the most amazing ways that God answered our prayers. The doctors had previously told us they didn't think one of the babies would have lungs, and they were surprised both babies were growing pretty much at the same rate. Our sweet babies we able to breath not for very long but they were born alive. Praise God from whom all blessings flow. Check out this video to see them breath. I did end up delivering the girls at 32 weeks but I was far enough along that they were born ALIVE! All the doctors did such a good job taking care of me and our girls! Dr. Tabor you were amazing and I thank God for you! The Lord worked it out so perfectly, really the only decision we had to make was to chose not to murder our children by aborting them. The Lord worked out everything else! I feel like I (Vanessa) failed miserably on this one. There are so many times I could have said more. I know a lot of times we did talk about the Lord's goodness and faithfulness but I could have said so much more. If you don't not know the Lord or are doubting your salvation please read this. There is nothing more important than where you will spend eternity. Thank you also to our friends and family who prayed for us and spread the word for others to pray. All the visits, hugs, tears, words of encouragement, cooking for us, cleaning our house, watching Kenya, running away together (you know who you are), ect,... can never be repaid. We thank God for you all! Thank you so much to everyone who brought us food. What a huge blessing it was to be on bed rest and know that my family was still getting fed a super yummy warm meal. Thank you so much for all the cards and emails we have spent countless hours reading all of them and being encouraged by all the Scripture in them. Thank you all so much for all of the beautiful flowers our house was full of life and it smelled really good too! Thank you to everyone who took the time to watch Kenya what a huge blessing it was to know that she was safe while I was resting, in the hospital, or going on a quick date with my amazing hubby. Thank you to everyone that took Destinee to school and picked her up! We have been very blessed by you all! Thank you to everyone at Destinee's school all the teachers, staff, and parents have been such an encouragement to us and have really worked with Destinee to help her stay on top of her grades after missing a week of school. We truly appreciate all of you! Thank you Margaret Lake! I don't think we will ever find the words to truly thank you for everything you did for us. Taking pictures at the hospital, taking pictures at the funeral, and even driving us to the grave side and back to the church. You went above and beyond anything we could have hoped for. Thank you so much, we love you. Thank you Ann Crowell, Keri Duckett, and all the staff at Gentle Beginnings Birth Center. Even though we were not able to use Ann to deliver our baby at home as planned they were all there to support us through out our entire pregnancy. If I ever had a question Ann was there to answer it (and let me tell you all I had a lot of questions!) She also was so sweet, she let me come in and she would measure my belly, find out where the babies heads were at and we would also listen to the heartbeat. I loved it because it was such a personal touch. At the specialist office all they did was sonograms which of course I loved because I got to see my babies all the time. But it was just nice to have someone get their hands on my belly :) They also prayed over my belly which was always such a blessing. So a big huge thank you to Ann, Keri and all the staff I love you all very much! Oh Ann and Keri also came to the hospital with a beautiful basket full of flowers and goodies to help my body recover. Thank you guys! Thank you also to all the people who came up to the hospital to visit us. There was several times we were not up for visitors but when we were yall were there and we love it. Thank yall for the flowers, gifts, cards and yummy food you brought us. Thank you to all the staff at the hospital, you guys were so loving toward us and took such good care of us! All off our nurses were amazing! -Dr. Tabor thank you so much for all that you did for us. You are an amazing doctor and I thank God for you. You helped us through one of the hardest things we have ever gone through. I'm so thankful that you were our doctor! - Senija you my friend, made me walk for the first time (the day after the csection) and made me go to the bathroom (too much information I know), took my staples out (again too much information I know sorry about that) you were a great nurse and a great friend! - And then there was the curly brown haired nurse and I think your hair was in a pony tail you were our nurse on Friday, November 14th. Friday was a very hard day for me it was the day Margaret got the slide show up of all the pictures from the hospital. After I watched it I couldn't hold it together. This was also the day that Jason, his brother and Dad went to make funeral arrangements. Needless to say it was a very hard day. My pillow fell off the bed and I started crying because I was mad that i couldn't pick it up by myself. I was crying over everything and no one was there but my sweet nurse. She just put her hand on my leg and stayed with me while I cried. Thank you for being there with me that day I needed you and you took very good care of me! - If any of our nurses or anyone that took care of us are reading this I would love to keep in contact with you. Please email me vkdelgado@hotmail.com. Really anyone that wants to can email me I love hearing from yall! - Thank you also to the guy who pushed my wheel chair out of the hospital, you were very funny and I really enjoyed our conversation. Thank you to everyone from our church who took time to pray, call us, come by yall were used by God to comfort us. Thank you to everyone who took the time to get everything ready for the funeral, setting tables, making food, running the sound. There was so much that went on I don't even know about half of it. Thank you all for everything you did. And my last big, huge, ginormous THANK YOU! Thank you to everyone that supported us financially. We are BLOWN away by how the Lord used you all to support us thank you all very much! You don't even have a clue how helpful all the funds are. I know this was a long post but I hope it blessed you all to see how the church from all over the world came together as one to support us during this very hard time in our lives. We love you all very much even the people we have never met! Thank you all! We truly thank God for providing you all to help us. Love you all & Soli Deo Gloria! My very favorite billboard just happens to be an advertisement for the hospital that we delivered at. It says, "My baby inhaled. I exhaled." We passed this billboard every time we went to see any of our three doctors. We were going at least once a week toward the end of my pregnancy. Every time I read it it made me cry, for 13 weeks I wondered if I would ever get to see my babies inhale. And only to the glory of God, I got to see my babies inhale,...and I indeed at that very moment exhaled. Watch Melody Joy (the baby on the left) as she opens her mouth and takes a breath.